Apple may be willing to restrict users from using Flash on its mobile device, but Android users will soon be able to experience full Flash experience. 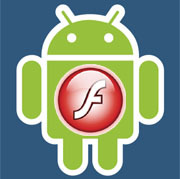 Adobe has officially begun private beta testing Flash player for Android. Simultaneously, Adobe is also preparing to test an Android version of Adobe AIR platform. It may prove to be a big setback for Apple in the mobile market. As of now, there are no certain dates for when can you expect for Flash to hit your Android phone. Adobe’s CEO has however divulged some probable details, during an interview. He has also given a hint that Google, RIM and Palm are also going to release a version of Flash on smartphones and Tablets, later this year. This however, is certainly a delay from what the company had promised before. It had set the target launch date for Flash on Android in the first-half of 2010. Meanwhile, you can sign up to beta test Adobe’s Android Flash player by creating an account here. You will then be notified by Adobe when the public beta becomes available.